Ahh, Craigslist. We’ve mentioned it together many times already here on Mr. Money Mustache, but it is such a great invention, on par with the bicycle as one of the Top Two Things that will Save America From Itself, that it deserves its own love note. Let’s illustrate with a little story. Early this afternoon, I was enjoying some manly hobby time, fiddling with tools out in the shed. Then a piece of wood fell over and bonked me in the shin. I picked up the wood, only to snag it on a fluffy bag of insulation poking out into the room. I tried to stuff this back into place, but the shelf was already overflowing with scraps of wood and other construction materials. “God Dammit!”, I said, “My shed is way too crowded!”. The root of all this evil was a pair of Papasan chairs that were also hanging out in there, taking up half of the floor space. They were surplus furniture – one from the good ol’ days in my first house, circa 2000 , and another left behind a few tenant turnovers ago in the rental house. Both in good shape and fairly stylish and modern, but just with no reasonable place to fit in our current house. Leave them in your garage or basement, forever cluttering up your life and let your children sort them out in your estate sale when you die. Plan to hold a garage/yard sale someday to sell them off. Pay an exorbitant fee to list them in the local newspaper classified in hope of selling them. Note that options 1 through 3 usually turn out to be equivalent – you are unsuccessful in unloading the items so they stick around and burden you until your death. Heaved them onto a reasonably clean section of my driveway with some trees in the background. Whipped out the iPhone and snapped a few pictures – an overall shot plus a few closeups, with cushions on and off. Ran the Craigspro app on the phone to log into Boulder Craigslist, type a description, upload the photos and click “Post”. (I priced the chairs at $25 each, in case you were wondering). Received a text message on said phone approximately ten minutes later. “Your chairs still available? Can I pick them up tonight?”, “Yup, here’s my address, see you at 5:00!”. 90 minutes later, helped the young lady who had just moved from Chicago to Boulder (a very wise move in my opinion) load them into her pickup, with a fresh fifty dollars rustling cheerfully in my pocket. Shed cleared, ‘Stash enhanced. What a fantastic invention Craigslist is. And the more popular it becomes, the more useful it becomes, since the market grows. It is the type of service I feel we need to save the world – completely non-corporate, non-greedy, and community organized. Craigslist does everything for free except for a very small subset of categories of postings (such as employment ads placed by companies in NYC). This small stream of income is enough to pay their tiny staff and run the service around the whole world. And what a service they are providing. Even though it is very simple, it enables countless millions of people to buy and sell products and services, free from advertising and commission fees. And most significantly to me, to get almost anything you need, used, and sell anything you don’t need for a fair price as well. The value of used goods is a funny thing. A high-quality front-loading washing machine and dryer set costs about $1200 new these days at a store. On Craigslist, you’ll pay $400-$500 for a very similar set that is just a few years old. The person you bought them from lost $700 on the transaction. But if you buy carefully and keep them good shape, you can use these appliances for a few more years and re-sell them for virtually the same amount if you need to move on or upgrade. The used-to-used depreciation is even less on longer-lasting things like furniture or garden tools. This brings up a neat possibility – not only should you use Craigslist instead of a retail store to buy every manufactured thing you need. You can also use it as a free way to “store” your unused goods. 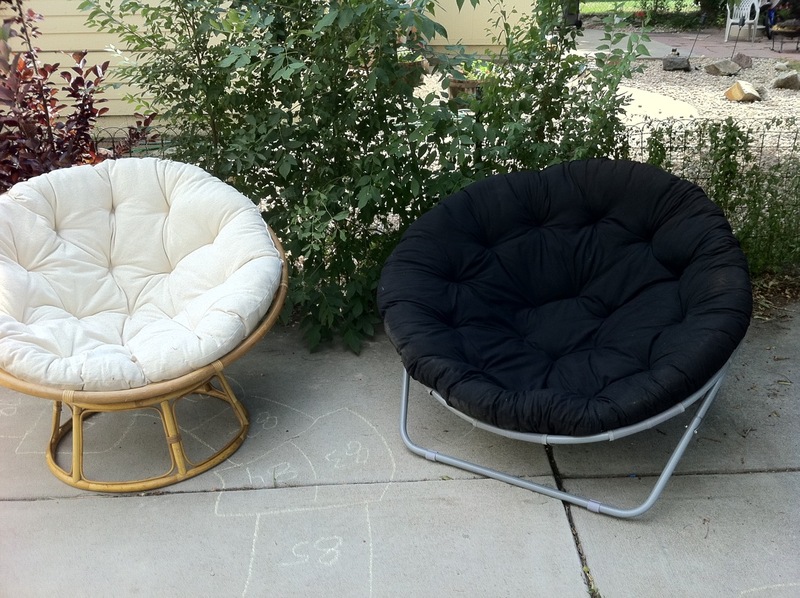 I didn’t hesitate to sell my papasan chairs today, because I know if I ever need them back, I can open up Craigslist and find plenty more just like them at any point in the future. I feel the same way about the 2001 Honda VFR800 motorcycle I “stored” on Craig’s a few years ago. She was my baby when I foolishly bought her new in 2001, but I just wasn’t finding many chances to ride by the year 2007, having no job to commute to and a young child to care for. I was hesitant to sell the bike, until I realized I was really just storing it and letting someone else pay for the continuing depreciation. There will always be an infinite number of motorcycles streaming by on Craigslist and if you need one, you just reach your hand into the stream and scoop one out. Over the years, I’ve probably done a couple hundred thousand dollars of deals on Craigslist, including finding about fifteen sets of rental house tenants, selling a car and a motorcycle, buying a different car and a minivan, plus an untold number of furniture and tool transactions. One time I really liked a person who came and picked up some free chairs from me – we are still friends today. Another time I wanted to learn how to re-roof my own house, so I posted an ad asking for an experienced roofer to come work alongside me to teach me how to do it. I got a reply the same day and hired the guy – That roof came out great, saved me $3000 over a roofing company, and I’m still friends with that roofer as well. Later he gave me a kiddie pool for my son and helped out on several other construction jobs in my circle of friends as well as offering work to me. So I view Craigslist not just as an Environment Saver – by preventing the unnecessary manufacturing of a bunch of new stuff – but also a Community Machine – connecting millions of people to do real activities together, as opposed to the soul sucking model of big corporations stamping out stores across the world, staffing them with minimum wage workers, connecting them to a stream of wasteful products flowing straight from China, and having us all drive into the big boxes every day to bring home SUV-loads of it which will soon end up buried in a landfill. But even I am just a casual Craiglist user compared to some. You can also use it to find a job, a lover, or even to make money as a reseller. Some people with an eye for value and a mouse finger built for speed search each day, finding undervalued or free items, scooping them up, and then re-selling them at higher prices on Craigslist or ebay. Arbiters in the world of used goods. Always take the time to properly stage and photograph whatever you’re selling. Clean it up, put it in front of a nice background, position the camera in a useful and dramatic way, and make sure the damned flash is off. Take ten photos, and post the best four (or whatever the maximum allowed is) on your Craig’s posting. For rental houses, link to an external website with at least 20 pro-quality photos, every room from every angle at a minimum. This technique alone lets me charge at least 10% more for my rentals than similar-quality homes with crappy Craigslist ads! Use loads of descriptive text, including full specifications, measurements, emotional descriptions of the benefits of owning this item, and include the price it cost new, to illustrate how cheap your asking price is by comparison. Have a catchy headline that includes the brand name and something like “high-quality”, “Fancy”, or “luxurious” in it. Silly old advertising words still work well, since they have a nice vintage feel to them, as if being spoken by a 1950s man with styled greasy hair. Once you have contact, make your offer in advance by email or phone, “I’d be interested in those speakers if you can let them go for $200. I understand that you might want to hold out for a better price, but email me back in the future if you decide this will work for you”. Once you are at the person’s house, your position is weakened since they know you drove there probably willing to pay the full price. Just like the real world, Craigslist is full of both wonderful and useless people, so you can hone your interpersonal skills by seeking out the former and learning not to waste time on the latter. But in general, I feel that the more of your business you can do locally on a person-to-person basis, the better off you’ll be in life. I just scored a $250 bike off craigslist two weeks ago after my last one bit the dust and was sold…on craigslist! I got my new one for half the price ($125) and he threw in some tools, a seat lock, and several bike locks. It was brand new in 2007 and was ridden home from the bike store, that’s it! Ooo it’s so nice :) I haven’t had a car for a year and won’t ever look back. Awesome article. Thanks to craigslist I’m able to run a business re-selling phones, and electronics. Not once have I run into trouble. Meet in public places, and use common sense and you will be good. I’m curious — where do you find the phones and electronics to re-sell? I’m looking into finding ways to make money using CL. One way to find things is a garage sales. When I was teaching, one of my students parents make their living cruising garage sales to find treasures and then sold them at their flea market booth. Today, I’d use ebay or craigslist if I were doing that. Last summer my husband and I decided it would be better financially to own one car instead of two (we live on a bus line). I used Craigslist to sell my car and I actually got the blue book value for it. I then used that money to pay off a student loan. All I did was wash the car and park it in front of some pretty trees for the photo. I had people calling me within hours of my post. I always check Craigslist before buying anything new. Could not agree more. We’ve saved hundreds buying and selling used bikes, stroller, wagon and other baby/kid stuff on Craigslist. Why pay retail for those things when they are outgrown within a couple years? We buy almost everything used off internet sites or at local flee markets. The main benefit aside from the enviromental benfits for me is that we bind less capital in our ‘stuff’ and when we do not need something anymore we can usually sell it to someone who needs it at a price very similar to what we payed for it. My wife’s wedding ring is from a second hand jeweler, it’s vintage from probably the 50’s or so. What’s nice with that is there aren’t many people with this style anymore and we don’t have to pay salesman fees or extra fancy lighting and rent all added into the price. I bought my wedding band too from the same guy, he just put the simple white gold band on a scale and named a price. Now our wedding bands are worth two or three times what we originally paid for them in 2008 because we didn’t have the hefty overhead costs, plus her ring is a style which isn’t seen very much anymore. The other thing which we got second hand was an expensive watch for my wife. This was before we found MMM, and it was better than my wife’s original idea. There is a special story behind it, she was very close to her grandmother and when she passed away she inherited about $600, doesn’t seem like much but in Taiwan it counts as quite a bit. She was hesitant about spending the money on anything because it was what her grandmother gave her. She’s always wanted a Longine’s watch but new they were a bit out of her range, but we found one used in good condition with the original box for a reasonable price. My theory is if you buy new the resell value is what we would pay second hand for. If we buy it second hand then the resell value is basically what we paid for it. Now she has a watch which she can remember her grandmother with which she wears on special occasions instead of $600 wasting away not doing anything because she’s afraid to waste it. I bought my car several years ago off craigslist. I’ve sold quite a bit on there too. Even met my boyfriend on there! Not in the sleazy dating category, but the Activities section. Always lots of free/low cost events posted there, perfect when you have just moved to a new city and don’t know anyone! Mr Mustache, another great post. Thank you. My problem is I really don’t like to bargain. Here’s the price, take it or leave it. I now have a coke machine on CL that I bought for $300 and selling for $100. I’m surprised I don’t have any takers. But then I sold a used smart phone and had about 5 inquiries in first 5 minutes of post. It really surprised me. Good point – I should mention that you don’t HAVE to bargain. Most of my own transactions take place at exactly the listed price with no haggling involved. It is only for larger or overpriced things that a little bit of friendly adjustment can be made if you like. It’s not like an Indian bazaar with wild price arguments constantly underway. I have to laugh at this as I just got a vintage Coke cooler (1960s) for Christmas from the 60s – not quite as large as a more contemporary “machine” but it was a bugger getting it down the stairs into the basement. On the bright side – I got it crazy cheap from Kijiji (Canadian craigslist) $125 because it currently isn’t working – but my Dad is an appliance repairman (hoorah!) who approved the purchase beforehand. He is coming this weekend for a visit and to hopefully get it running for me. I don’t care if it’s big and heavy – I will take it with me anywhere I go. And I am convinced, in my location (near Toronto) that, working properly, if I ever do decide to give it up, I can and will make money on it. if option 5) is sell on Craigslist, then option 6) is hire me to pick up your old (but still useable) stuff and sell it on craigslist. There are a whole lot of people who have too much stuff – stuff they never use – who want to free up space. But though many are responsible enough not to just dump it in the ocean, many haven’t quite caught on to the mustacian principals, so instead of selling it or giving it away on CL, they hire someone (like me!) to come pick it up and haul it away for them, knowing that it will be donated or sold instead of turned into landfill. job – still work occasionally at the bikeshop I found in a CL ad almost 5 years ago. I once had a customer who was clearing out their garage of old stored stuff. They had (among other things) some fancy Scandinavian design style bookshelves which had been disassembled for storage. I charged them to pick all the stuff up and haul it away. Most of it was good enough for reuse, but not good enough to sell, so I gave it away. But the shelves were in excellent condition, and I posted them for sale on CL. Well, the buyer had no way to pick them up, so they hired me (as a mover) to deliver them. They weren’t sure how to set them up, so they hired me (as a handyman) to assemble them. Same person is moving to a fully furnished apartment, and they remembered that I get rid of unwanted stuff in an environmentally responsible manner. So they give me a call to get rid of all their unneeded furniture. Including the shelves they bought from me a year earlier! So I pick them up again (for a fee), and repost the old ad, and sell them (again) and deliver them to someone else. MMM – another great entry and spot on. We use CL only for getting rid of larger stuff, have privacy concerns so small stuff not worth the time or money (we usually donate the small stuff). We also only post cell phone number for inquiries so that we can’t be reverse looked up and address only given to the ‘winning’ acquiree. We use CL for acquiring items needed. Great tool: http://www.searchtempest.com. Enter your zip, radius for review and item you are seeking. Searchtempest will look across the radius of all the CL’s in your area, no need to individual search each CL. We just acquired a 3 yr old softub for $350 which would sell new for $4.6k – Woo hoo CL and searchtempest. We are now soaking fools. Its funny that you mentioned Papusaun chairs, as we went though the same spiel as you. We sold them for 75 a piece here which was great, as well as a bunch of other stuff. We sell our old stuff, and we get nicer used stuff. It is awesome!! You just have to know what you want, be patient, and you will be rewarded. I do hate the lowballers out there,but oh well. You got $75 for yours?! Damn, I was too generous with mine. Maybe if I used your fancier and more European way of spelling the chair names I could have fetched more. I just spent $160 at Pier 1 to buy a papasan chair and cushion. Next time, I’ll look at craigslist first. My brother just sold his old Lincoln Town Car for $1,500 on CL. It sold in one day. I think you meant Honda Insight. Sounds like a great deal – even I could be tempted into a nice used hybrid given the right auction or insider deal. You’re right, it was a Honda Insight. Find a friend with an auto dealer license and he can show the online auctions. My brother said he paid $16,000 and it would have been $19,000 at a dealer. Lovely ode to Craigslist! I’ve found multiple apartments, cars, furniture, and bikes through the site. Even bought & re-sold my wedding dress on it! MMM, I liked this post a lot. I have been using c-list for years for all the reasons you mentioned. I will add another verb you can do in addition to storing things on c-list, and that is testing things. I am an outdoor gear junkie but hate to pay retail for stuff. So if there’s a backpack, or bike, or type of skis I want to try, I look for a deal on a used one on craigslist priced such that if it doesn’t work for me, I either make a few bucks for my time or at least break even when selling it. – If you’re reading this post, I still have the item. – Please respond with normal english sentences. If I think you’re a spammer, I will delete the email. Bakari, I agree about the scammers. Mostly I’m just tired of emails like this: “saw your ad on the craig list live in boulder too want to see bike”. Humans that type that way are the same ones that show up talking about how they forgot the other $50 bill on the table, and would I just take what they brought. yeah, good point. that’s true for me too. Craigslist is amazing. Unfortunately, I have found that in a rural area it is almost non-existent. There is plenty of land and large houses so people don’t mind holding onto their stuff. Another reason I am excited to move back to a large city and share resources in the future. Craigslist saved me $1,100 on a tool I needed for my business last week. I had been looking for the item used for a while and was close to giving up and buying it new but gave CL one more try. I was so happy to have found what I needed in perfect condition for $950 vs $2000. Deals like that add a little more stubble to my money mustache! Craigslist is also absolutely phenomenal for pet accessories. People go to big pet stores and buy crates, carriers, cat climbing trees, aquariums, and get them home only to have their pet never use the item, out grow it, or die (this is very often in the case of people buying $500 aquariums for some gold fish…). You can find these items for very little money, bring them home, disinfect them, and let your pets enjoy them without shelling out hundreds of dollars! I’ve been keeping my eye on CL waiting for the perfect large aquarium to give my ball python some more room to move around, then I’m going to sell the current snake habitat and probably end up breaking even. Craigslist rules. I also like to use craigslist as an alternative to freecycle for getting rid of “worthless” junk around my house. People will take almost anything if it’s free – and it saves me the cost of taking it to the proper disposal place, and it gets recycled in some way. Win win! Now I just need to find someone to take the 20 gallons of old paint that we inherited with the house for free, although I don’t think that will happen. I do exactly the same thing. For things I don’t want to bother to sell, I just post them in the “Free” category. *AND* I could care less what people do with them — they could even turn around and sell them on CL the next day. I just don’t want them cluttering my life! I would give them away to charity, but around here it is virtually impossible to get Purple Heart to pick something up. They just don’t have time for some reason. Some folks get irritated when they give people something for free and those people then sell it. But I figure in this economy, I don’t have a problem with helping someone out that needs the money by simply giving away stuff I don’t want. Actually its really easy to get rid of old paint. I did a website for a company (click the link in my name) that recycles old paint into new paint. We have found some great deals on CL, most recently a flat screen tv and a dishwasher for less than half the cost of new. I really want to sell some things but I am concerned about safety. I am a little paranoid about strangers coming to my home. Any advice on this? Sure.. You could always do the transactions when you are not home alone, or you could arrange meetings outside at a public spot like a park’n’ride (as I did just yesterday to save someone from driving to my town). Craigslist people are on average very nice, 100% of my hundreds of transactions have been with gentle, smily people. But for extra screening you could insist on an email response first, and call back only people who write well and leave you a real email address and local phone number to call them back at. In general, I think we are too fearful as a society. Bad encounters with strangers in situations are incredibly rare (statistically). Driving is far more dangerous but we still do that without worrying, right? In general, my wife does all the listing, and if it fits in my Honda Fit, the transaction happens outside (not in! Then I’d have to buy) a local coffee place. That way I can just take the item to work with me and then make the trade on my way home. I have to drive past it anyway and it makes everyone more comfortable. For larger items, we only send the address by text, and then only within about a half hour of the transaction. And we do insist on an email response first, just to avoid giving our our numbers. For all but the most expensive things I sell, I just put the item outside in the driveway, and tell the buyer to drop money through the cat door. That way we don’t have to worry about trying to synchronize schedules. In 5 years, only once has anyone taken something and failed to leave the money. Though this would keep you from having to open the door to strangers, I agree with MMM that its pretty unrealistic to think that someone is going to attack in that situation. If someone wanted to randomly attack someone, they wouldn’t have to pretend to want something on CL, they would just do it. It might be a concern for posting under “romantic encounters”, but not for selling furniture. Trulia and Zillow are the incredibly free equivalents to Craigslist in the real estate world, and are going to increasingly loosen the Realtor stranglehold on the market. They are the ultimate in free tools for Mustachin home owners and would be home owners. I’ve researched there for free, advertised there for free, sold there for free, and even carried a mortgage from people who found my FSBO there… for free. This is a tried and true Mustachian method, and they deserve some sort of a Mustachian Award. Ask and I’ll tell you more. I recently found your blog and have been catching up on the old articles. This one makes me smile, because it is particularly timely. I have recently issued a challenge to myself to see if I can make $500 selling off unwanted clutter by the end of the year. Since I think anything priced less than $10 is not worth the time the process takes, that puts me at 50 items if I sell at the lowest price, or fewer if I have bigger items. I work at a University, so I also cross post stuff on the FYI email list, which is how I sold my first item, a textbook I bought when I was in practice, but which I no longer ever use. $50 down! Also, in addition to cash, I have accepted Paypal in the past. All you need is an email address and a verified account and you can deposit it directly into your bank account. But usually I prefer cash. I’ve had a fairly poor relationship with craigslist. I can find good deals and buy stuff just fine, but trying to sell things on craigslist is an experience I prefer less than gouging my own eyes out. Why is everyone on craigslist an idiot? Why do they haggle over the already very good price I’m offering? Why do they ask me questions about something instead of reading the description? Why do so many of them never show up when they say they will? I suppose if I were retired and had more time on my hands, it wouldn’t be such a big deal. But I have things to do, and it’s frequently easier to donate it to goodwill. My current marginal tax bracket is 25%, so I can either take the time to sell something on craigslist for $20, or I can donate it to goodwill and claim it was worth $80 on my taxes. It works out the same financially, but I spend a lot less effort just dropping a ton of stuff off and getting a nice tax return at the end of the year. Plus, in my house cash gets spent on random junk whereas a tax return goes toward investments. Haha.. you are right that most people out in the world are unprofessional flakes, including on Craigslist. To help weed them out, I like to put skill-testing questions in my craigslist ad. For example, if you provide only an email address and no phone number, it filters out people who can’t write email. Then you can exchange an email or two to make sure the person sounds intelligent/organized enough to be worth doing business with. Otherwise, just tell them it’s already sold. The whole “test” only takes 2 minutes of a person’s time, but it can save you from a bunch of hassle. But yeah, craigslisting a $20 item can be a waste of time, unless it’s bulky and hard to get rid of otherwise (eg a roll of carpet). I usually sell things for $50 or more, otherwise donate them. MMM – I took your script, nearly verbatim, and used it to score my first “adult” bicycle! I even got it for 30% below their asking price – I think just because of your polite script! Thank you so much. I now have a bicycle for $25 and a trailer for $30. Just need some safety gear and I’m good to go the MMM way. I bought a huge 57-inch HD Sony projection TV on Craiglist when I first got married in 2007 for $300. It was about 4 years old and had retailed for like $5,000. (No joke!! I believe it was one of the first HDTVs.) We picked it up at a very fancy house with a Lamborghini or equivalent out front. It was owned by a very sweet older couple who wanted to upgrade to a 70-inch screen, and they had taken very good care of it. We had no idea what a score we had made!! It even came with the manual (came in handy quite a bit over the years). We were spoiled by that huuuuuuge HDTV for FOUR long years. Everyone loved watching TV or playing video games on the generous screen. I was sometimes to embarrassed by how it made us look so lavish that I would go into my speech about how it only cost us 300 buckaroos. We watched as our friends would brag about upgrading to a big 40-inch for 5 TIMES as much as we paid for ours! They financed them no less, bragging about no interest for a year! (Huh, ours probably cost what they paid just in interest.) The only downside to ours was the space it took up and maybe the electricity usage… we had the space in our last place (big ol’ rental house). We took that $130 and bought a 40-inch less flashy flatscreen for $320. (If you’ve never heard of Slickdeals.net, I suggest you educate yourself right now!!) The TV is not name brand, but comes with a Samsung panel making it probably worth twice as much. I sold my TV making the cost only $190. Amazon didn’t charge taxes in CA back then… *cry*. This new TV will save us on electricity and it makes our tiny apartment look so much bigger! Plus, we’re trying to watch less Hulu & Netflix these days… so a TV isn’t really on our “Splurge priority list”. In the end, Craigslist was a WIN WIN WIN for me. That’s just this one example, don’t get me started on the $25 vintage tufted couch score. Great info regarding Craig’s list. I never realized how useful the site could be in achieving a Mustachian Lifestyle. I had been scared off when a friend purchased a futon that was contaminated with bed bugs. He ended up spending several times the cost of a new futon in exterminator fees. Update: My garage is full of scrap lumber. I had planned to purchase a “bagster” to remove the entire pile. Would have cost $129. Posted the lumber for free on Craig’s list and in less than 30 minutes had 6 people who offered to pick it up. One guy lived just a few blocks away. We loaded up his truck and now my garage is clean! It feels great to save money, prevent items from going into the landfill, and help out a neighbor. Craigslist is also great for young Entrepreneurs. My 13yo son started breeding his rabbits and selling bunnies on Craigslist. He just started and made $80 his first week. He’s got 5 more bunnies ready to be listed any day. Now I have to start teaching him the Mustachian Laws of Money! I really like craigslist too. I however wanted to pass along an alternative to selling. When I have found that I couldn’t get what I wanted for my used stuff on craigslist or at a garage sale I would donate it to goodwill or some other charity and then put it on my tax return at the end of the year. Be sure to keep a copy of the donation receipt. There is even a software program to help you value the used items called it’s deductible that uses ebay prices for valuations. One other advantage of these services, is you can post and then repost and eventually someone may buy it. I just sold some stereo equipment, that took 482 days to sell. I was storing it anyways, so there was no extra work to keep it that long but I did eventually make some money off of it. My wife and I are looking to move, so we’ve posted our kitchen table, and some other old furniture we don’t like and don’t want to move with us. If someone buys before we move then great, in the mean time, we can continue to use the items. Up here in Canada, http://www.kijiji.ca seems anecdotally as popular or more popular than Craiglist. It’s much the same thing except the website is a little fancier, allows more photos, and has better searching filters and criteria. The ability to filter search results by distance from your address is quite useful. Yeah – I was initially annoyed by Kijiji because it is spammed out with intrusive banner ads. But everyone uses it in Canada, so you have to as well. But then Adblock Plus for Google Chrome solved the junky ad problem, and all was well. I’ve had a lot of fun with Craiglist the last few months. I haven’t had a need to buy anything off of it yet, but after my wife and I decided we were done having kids I started posting all of my son’s baby stuff. We moved from a 4 bedroom house to a 3 bedroom apartment a couple years ago so we have a garage full of excess. I cleaned the garage last summer and identified a third of the space was baby stuff, excess furniture, and even dishes and appliances from our wedding 10 years ago we’ve never used! I’m halfway through the baby furniture and I’m about $250 better off. The hardest part of putting so much on CL is at the end of the week whatever doesn’t sell has to be reposted which is tedious. The only problem I have with craigslist is that my wife puts too much time into it. I think she would be better off using her free time to learn a new skill. At least she has two monitors and is able to relax while she’s doing it. That said I am thankful for it, she has done a great job getting rid of our excess over the years. We actually made bank on a couple buys/resells over the years too. I especially like the point about using Craigslist as “storage”. I was on the fence for years about buying a tandem kayak, as I didn’t know if I’d be able to store it in potential future apartments. I’m kicking myself for not picking one up on Craigslist earlier, because the used market for these things in San Diego is flat – you can pretty much expect to sell it for within a hundred dollars of 500 regardless of age or condition, and they move quickly. We’re now enjoying the kayak and the knowledge that we came out ahead over rental fees the first weekend we took it out. Yeah, that was a shock to me as well. Sounds like the woman who did it went completely off her rocker. It is always good to do some sanity testing on your potential Craigslist business affiliates first – exchange a few emails and verify reasonable communication skills, do a little searching and see if they really own a house, check out the surrounding neighborhood on Google Maps, etc. Not 100% safe and I don’t know if it would have prevented this horror show, but very easy to do and worthwhile – it helps me narrow down my own transactions quite a bit. We love using CL to unload unused stuff in our house and put some spare change into our stache. Without having ever read the blog, “A Millionaire is Made 10 Bucks at a Time”, my wife laid out what is known to us as “The 10 Buck Theory”. She said that if something isn’t worth $10 to someone on CL, then it probably isn’t worth my time to post it, haggle with people over email, potentially burn gas, and take the time to make the sale. So if we have something worth borderline nothing, it gets posted for $10. If it sells – great! If not, move it over to “free stuff” section and put it on the curb, or donate it, or whatever. But $10 is our bottom dollar…no haggling accepted below that. – A 60 gallon propane tank from an old truck, still half full of propane and getting kinda rusty. It had been sitting in our garden for 12 years, basically serving as the neighbourhood timebomb. I had initially looked into paying for someone to pick up and dispose of it (which would cost about $150), but instead managed to sell it for $50. – Approx 100 used 6×9″ bubble-wrap envelopes from shipments I had gotten over the years from mail-orders. All were cut open and covered in shipping labels, but I was still able to get $20. – Scrap concrete: a local disposal company quoted me $400 to dispose of 1 cu yd of broken up concrete, but instead I listed it as free concrete fill on Craigslist and was able to get rid of it for nothing. I didn’t even need to help with loading it. I did a similar thing for leftover sod and dirt. “as opposed to the soul sucking model of big corporations stamping out stores across the world, staffing them with minimum wage workers, connecting them to a stream of wasteful products flowing straight from China, and having us all drive into the big boxes every day to bring home SUV-loads of it which will soon end up buried in a landfill”. That’s tremendous – couldn’t agree with you more. My recent appliance epiphany – good condition gas fired dryers on craigslist for $150 dollars. I did a calculation on http://michaelbluejay.com/electricity/dryers.html and figured out my electric is costing me more than $150 more a year in utility. Good gravy! My wife agreed to limit our electric dryer use but won’t agree to mismatching the pair with a used NG dryer. It’s only a matter of time before I win her over… hmmmm. All of my favorite jobs were found this way. All of the places I’ve lived, most of my furniture, baby crap, books, games, are scooped up here. I get all my gardening stuff this way. If I fancy a gizmo, there are a plethora of gently and barely used gizmos taking up precious space that people practically give away. Years late to this, I’ve just discovered your blog and I’m making my way slowly from back to front. When I got divorced and found myself very abruptly going from a paid-off condo to a room in my parents’ house with a very un-mustachian lifestyle and set of expenses, craigslist was an essential part of my transformation to a more frugal lifestyle and moving back out of my folks’ house pronto! I unloaded years’ worth of luxury items that, looking back, I can’t imagine why I purchased to begin with. I made several people very happy, and with the combination of offloading luxuries and a hard look at my spending habits was able to get back out of my folks’ house in 4 months and pay off the entire divorce and the rest of the consumer debt I had racked up during my marriage in under a year! I’m a long way from a full Mustache, but so proud of how far I’ve come and eager to keep making changes in the right direction! Tried to price out IKEA furniture new, cost $360 + tax. Got the exact same items off craigslist for a grand total of $55 dollars in great condition! Craigslist works amazingly well (more so in tight urban areas like NYC) for large items and furniture because most people simply don’t have the space for them. However, some items are terrible buys on craigslist, or at least, require a LOT more scrutiny. I would not purchase any electronic items due to high risk of non-visible damage, theft flags (cell phones) and quite frankly, the asking prices are ridiculous. Another place that can be a great alternative to craigslist is Facebook market. The main benefit is that you can interact with the seller/buyer live and identify them via profile before you actually meet. You can also avoid giving out personal information as the Messenger enables calling and texting in-app. Re-read this one and it has motivated me to de-clutter further. Thanks MMM! I’m curious about how you hired a roofer. I’m about to buy a house in Detroit and am looking to do as many of the repairs myself as I can. I never considered this idea before–how did you find someone who knew what they were doing well enough but still didn’t require a contractor’s fee? How did you know they knew what they were doing or that you could trust them? Thanks!